As the Assyrians got weaker, pieces of their empire began to break off. People saw their chance to become independent and grabbed it. Egypt became independent again. So did Israel for a while. But then in the 600s BC a new empire started up. It was centered on the old Mesopotamian capital at Babylon. Under King Nebuchadnezzar (neh-buk-kad-NEZ-arr), the Babylonians reconquered most of the old Assyrian empire. They tried to convince people that they were not newcomers, but reviving the old empires of long ago. 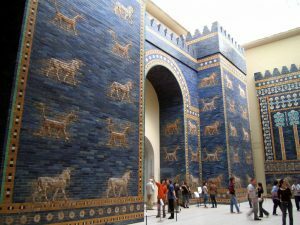 So they built a big gate using the old Sumerian molded clay bricks instead of stone. The Babylonians conquered Israel, but the Jews revolted and tried to break free. So the Babylonians came back and defeated them again. Now they took many of the Jewish leaders and their families back to Babylon with them to keep them from revolting again. People call this the Babylonian Captivity. The Bible stories of Jonah and Daniel are about this time, and the prophets Ezra and Nehemiah lived in Babylon at this time too. 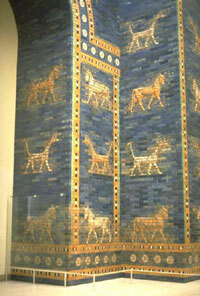 The Babylonians also did a lot of new building in Babylon during their time in power. But it didn’t last very long. In 539 BC, the Persians, under their king Cyrus the Great, conquered Babylon and ended the Babylonian Empire. The Babylonians: An Introduction, by Gwendolyn Leick (2002). Covers the whole history of the city of Babylon, from Hammurabi down to Alexander. Babylon, by Joan Oates (1986). Cite this page: Carr, K.E. Neo-Babylonians – Mesopotamia – West Asian history. Quatr.us Study Guides, September 13, 2017. Web. April 24, 2019.